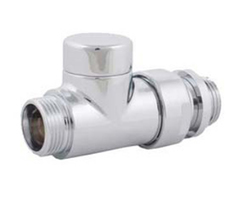 The DE LUXE return valve allows shut-off on a radiator return connection. When both the intake and return valves are shut-off (thermostatic head in position 0) the radiator can be removed while the system is under pressure, without having to close off the rest of the system. The return valve ensures exact control of the water flow rate through the radiator in accordance with the desired heat output, as well as hydraulic balancing of the system.